Seth Jenkins kindly asked me to port the jBlackGlass iPod Video theme to the iPod photo, so I did :) but before I take all the credits :) I should say that I couldn't do it without his help, hi helped me a lot with testing and so on, so I would like to thank him for all his help and time with this! Thanks again Seth! Copyright: I think I stay with the same note that I wrote at the video version of this theme. 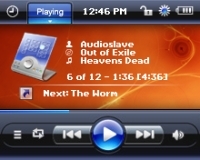 NOTE: A lot of people asked me for the font (nedore-9.fnt) which is used by the theme, and because the fonts are provided by rockbox I didn't pack them into my themes, so VERY IMPORTANT download the latest font package from the rockbox server and you should have the right fonts. 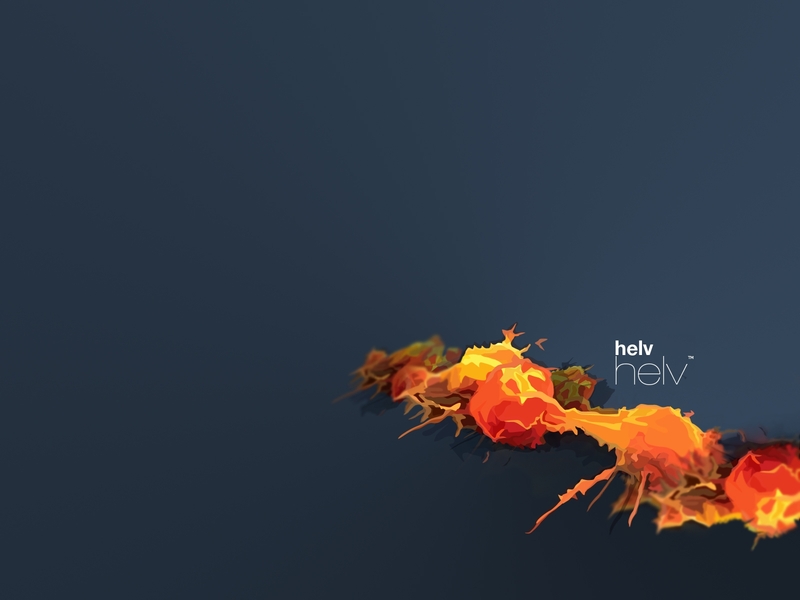 I just found a great logo for rockbox which was done by S3TUP so, big Thanks to him! and I thought it would be great if we used this one when rockbox boots, so I did a little patch and everything works like a charm. and get the Patch from here: full_screen_logo.patch which is required for placing the image at the top edge of the screen, and to remove the version label from the bottom, so only the background is shown. As you can see there are 11 themes in this package, I used a few of my preferred background images, but feel free to use your one, you can get the psd file from here, just add your background image and save the result to your theme directory. 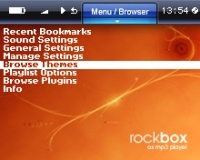 See here for more details about creating rockbox themes. Copyright: hmmm, good subject :). I think WMP11 is done by Microsoft :) and the background were created by different people, but I don't really know which one was made by who, so please don't be mad at me if you don't see your name here, just send me a letter and I will put it up, but I would like to thank you in advance for this great wallpapers and I hope you don't mind seeing them here. Note: Stev just pointed out that the "jellyfish" background was made by the Digital Blasphemy art team, so I would like to thank them! and some of the other backgrounds are from DeviantArt, so thanks to them and to the authors too! 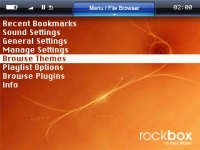 NOTE2: A lot of people asked me for the font (nimbus-14.fnt) which is used by the theme, and because the fonts are provided by rockbox I didn't pack them into my themes, so VERY IMPORTANT download the latest font package from the rockbox server and you should have the right fonts. It was time, really :) Ok ok, so when I first read about vim 7 I thought this is it, this is exactly what I was waiting for. 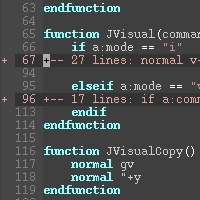 Till now I used Anjuta for coding, so I had to modify some of the vim default settings so I have a little compatibility between this two editors. So what did I do? 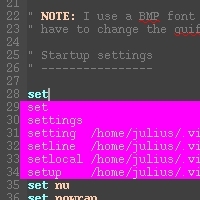 the first thing that I used a lot in Anjuta was the Shift+Arrows to select some texts, I know there is a good one in vim to by using "v", "y", "p" and so on, but in insert mode I need to be able to select a part of the text and with a backspace or del cut it out, you know when you have to delete more lines it is hard to delete them one by one. 3: Auto complete mapped to all chars, so when you type a popup menu is shown to select from a word list. 4: Automatic fold method (fold method set to indent), and map Space to open/close folds in normal mode. 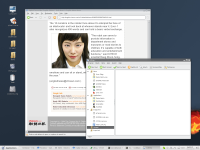 That's it, I tried to make things as compatible as possible with vim, so you can use all your standard vim keys. but don't forget, this is my first attempt to write something like this, so any feedback/addition is more than welcome. This would be a little howto to get iTrip with dock connector up and running on a 5g iPod with Rockbox. 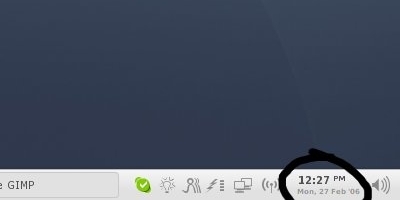 2: The second thing is the apple protocol which allows sending commands trough the dock connector to the iTrip. To fix the first thing I went to the Rockbox's IRC channel, and to tell you the truth I was amassed about the help I got there, the rockbox team is really co-operative, I must thank especially to linuxstb, he helped me a lot with directing me to the right places, so after testing some of the codes from the iPodLinux project, we found out which one turns the power supply on, and now its already in the cvs tree. So the first thing seems to be done, now we have power supply on the dock connector, so some of the iPod accessories may already work. The second thing is a bit tricky, for the moment we don't really have a working apple protocol on 4 and 5g iPods, so there is no way to send commands to the iTrip which are required to turn the iTrip on because even if you have power on you dock connector, the iTrip won't power up till it receives the play command. But don't worry, there is a solution for this :) it's not the best one, but it works. So what I did was to get the iTrip apart and found out which pins are used for the power supply. See here for the dock connector numbering. So if you take two little wires and meld them to this pins on the iTrip then you will be able to attach a second power supply to it which don't needs to be always on, just for a few seconds. 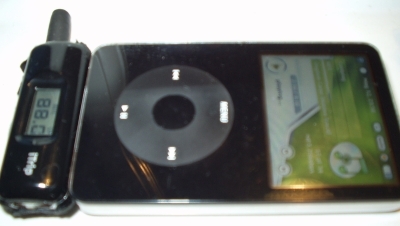 So if you done this, dock the iTrip to your iPod, fire up the original firmware and press play, this will turn the iTrip on, now connect you second power supply to the iTrip and restart your iPod by holding the Select+Menu buttons pressed. 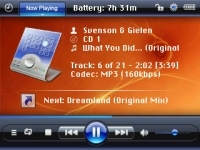 You will notice that even when your iPod is of the iTrip is still on, so you can now boot into Rockbox and disconnect the second power supply because we have power with Rockbox too. I attached two little flat batteries to the back of the iTrip with a little button, so I just press that small button when I reboot into Rockbox and everything works fine.